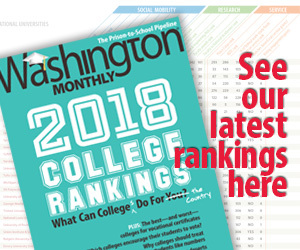 Washington Monthly | Good Enough for Christopher Newport? Good Enough for Christopher Newport? An undergraduate degree from one of the top 99 national liberal arts colleges or the top 35 national universities in the U.S. News rankings. A terminal degree from one of the 69 best national universities in the U.S. News rankings. A terminal degree from a doctoral program ranked in the top 35 percent of National Research Council rankings. Election to Phi Beta Kappa. Now this particular strategy, while a little vulgar, is not a ridiculous. While it’s probably more important that a candidate received a terminal degree from a respected doctoral program than that he attained an undergraduate degree from “one of the the top 35 national universities in the U.S. News rankings,” hiring at many institutions takes this sort of thing into account. Human resource practices at most companies are usually couched in language about “good schools,” however. It’s highly unusual to make a specific reference to one magazine, but still. People are interested in where job candidates went to college, in part because this says something about a candidate’s intelligence, interests, and work ethic. As far as U.S. News is concerned, Christopher Newport is a tier 2 school. That means that it’s one of the magazine’s unranked schools, listed alphabetically.